D-30F6 is military two-shaft, two-spool engine with mixed afterburner chamber for both inner and outer flow and with regulable exhaust nozzle. 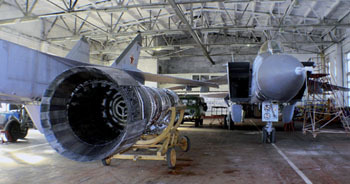 Engine is intended to be used on supersonic interceptors and fighter-bombers MiG-31. Soloviev's design team from Perm started the developement in 1972. The team comprised of two companies - Aviadvigatel and Motorstroitel. The developement was finished in 1980. As can be seen from the engine's name the engine was based on D-30 line from Il-62M and Tu-154M passenger planes. 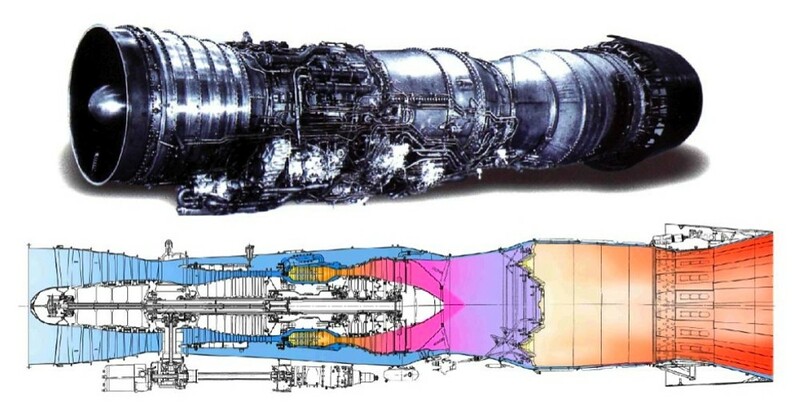 Two-spool scheme significantly lowers the specific fuel consumption on dry thrust thus significantly increases range od MiG-31 against it's predecessor, the MiG-25. Neverthenless the engine gives the plane a good altitude-speed characteristics also - top speed 3000 km/h, operation altitude 11 to 21 km and as can be seen in some sources low level flight speed 1500 km/h. Another advantage of this scheme is lower thermal radiation inside the plane's fuselage. Interesting thing is that this allowed to remove the 5 kg heavy silver coating of thermal shield around engines which was used on MiG-25. 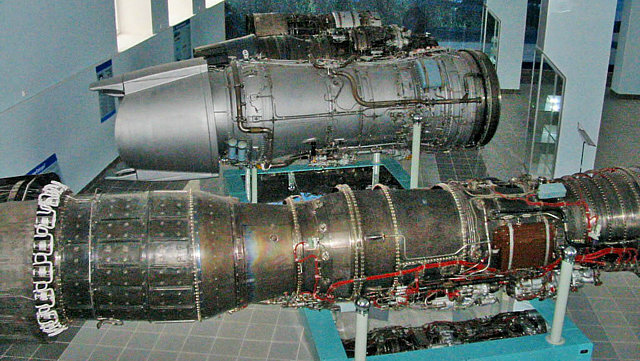 The D-30F6 is the first soviet two-spool engine with afterburner. It proved it's reliability in wide range of weather conditions during it's more than 25 years long operation service. Construction scheme is modular, consist of 7 modules. All the modules (except for base) can be replaced during service. Electronic-hydraulic system of automatic engine control is duplicated by hydraulic system ensuring safety of flight and back-up function in case of electronic system malfunction. The design of the engine provides an opportunity of the parametric control of its condition aboard of the airplane. To evaluate the condition of the air and gasflowpath parts in service, the engine design provides for the inspection of all compressor and turbine blades, and also, nozzle vanes of both high pressure turbine stages. 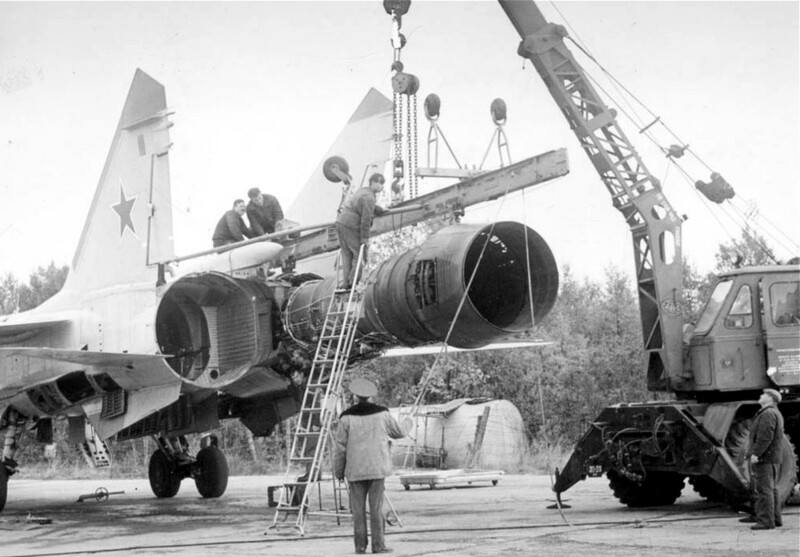 Besides the original D-30F6 for MiG-31 there were a few modifications also, among others the engine for experimental twin-engine S-37 (Su-47) prototype and high altitude subsonic twin-engine M-55 plane. 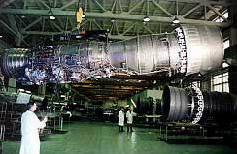 In the first case the engine is sometimes designates as D-30F11, the information is not confirmed. 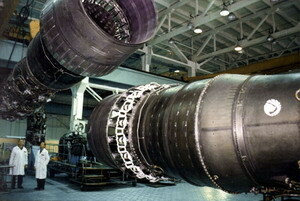 The second case engine was unaugmented D-30V12 derivate with 9000 kp (88,2 kN) of thrust. M-55 plane took of in 1988 for the first time. The engines ran reliably in extreme conditions with air temperature of -92°C. Some other variants which probably existed only on papers were to equip 5th generation fighters. They had to have increased thrust among other improvements. Another engine came from the original D-30F6 design, the D-21A1. It's a two-spool engine with supersonic nozzle intended to power high-altitude supersonic bizz-jet S-21 from Sukhoi design boureau. Construction scheme is almost the same as is for D-30F6 except removed afterburner chamber. Emphasis was placed on low emissions, noise and influence on ozon layer. One adavantate of this engine was the short developement time thus low developement cost. This lead to a relatively low final price. Three D-21A1 were to power one variant of proposed plane. 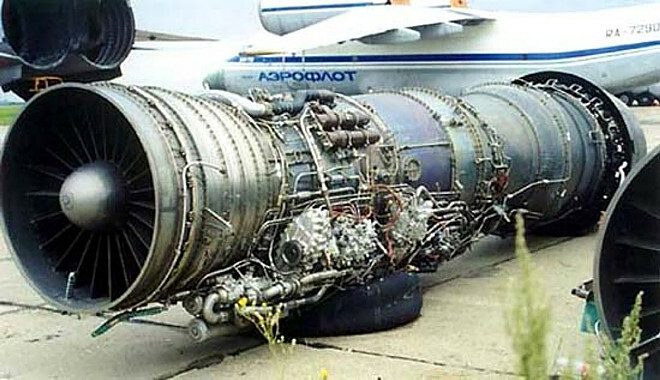 Competitiors for the russian engines are british Rolls-Royce engines among others. Gulfstream Aerospace joined Sukhoi at the beginning of 90s for a short period. But then technical and financial problems occured and S-21 project was cancelled. Serial production of D-30F6 has come to the end, total approx. 1500 engines were built. Today the Aviadvigatel aims itself on service life prolongation of these engines. One source mentions yet another thrust parameter "Frontal (max)" in value of 18980 kp (186,1 kN). I'm not sure what this means exactly. D-30F6 in the front and D-30KP behind it. We provides a leading design solution of electronic as well as specialized items designed for specialist tradesmen. We provide one stop option from concept to prototype, and ultimately to mass production with top quality to set you back proportion. Constant growth for many years has been kept through a commitment to offering excellent quality product or services. With a diversified business strategy, we boldy goes after new and also distinct innovations to offer the digital application markets. We supply computer shows (C, C++, C#, Python, Matlab, etc. ), and simulation as well as information evaluation service. Computation as well as simulation. Sound and also video processing. Souring IC Ltd is a Hong Kong based company with China workplaces in various provinces. We provide a large range of digital components, specialized in IC consisting of Sound IC, Power Monitoring IC, Customer Electronic IC, and so on. Our goal is to supply any kind of components which are difficult to be sourced in the digital market, particularly the one discountinued by manufacturing facilities. With the help of most recent A.I system and the elite colleagues we owned, we have the ability to resource every ICs that is not typically used by the co-operation with thousands manufacturing facilities and agencies in China. We are able to provide the most affordable price without MOQ. My name is George, and I was wondering if you would like to have your website leteckemotory.cz promoted as a resource on my blog georgemartjr.com ?